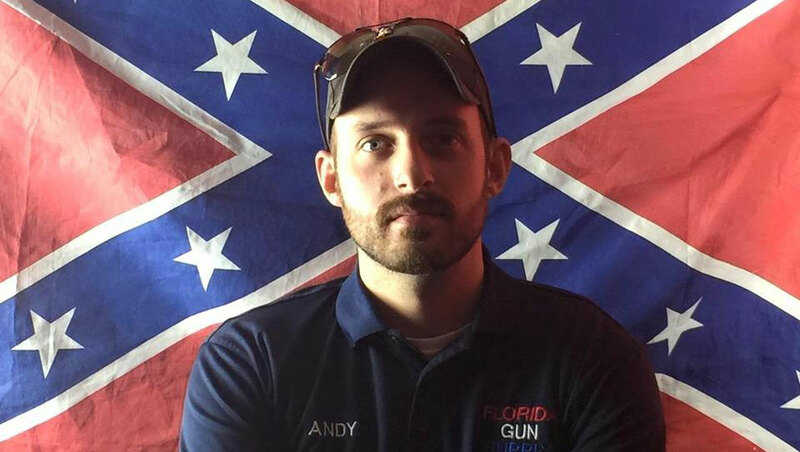 Gun supply store in Florida declares itself "Muslim-free zone"
With the Confederate flag draped in the background and referring to the people he is speaking to as his "fellow patriots," a gun supply shop owner declared in a Facebook video his store in Inverness, Florida, is now going to be a "Muslim-free zone." In the video now viewed over 60,000 times, Florida Gun Supply owner, Andy Hallinan, said his shop will be making changes immediately to "make America a safer place to live." In the video posted July 18, Hallinan speaks about the Chattanooga shooting where five service members were killed and three others wounded by suspected gunman Mohammod Youssuf Abdulazeez. Hallinan said he believes the attack isn't an isolated incident. He then goes on to outline the changes coming to his gun supply store in response to the Chattanooga attack. "Our leaders are telling you that Islam is a peaceful religion, full of tolerance and love and hope. Don't believe their lies," he says. He said concealed carry classes will be free, so people can get armed and trained. And his shooting range will be open to the public for free, so the public can be ready if they need to defend their lives and community. "I have a moral and legal responsibly to ensure the safety of all patriots in my community," Hallinan says in the video. "So effective immediately I am declaring Florida Gun Supply as a Muslim-free zone. I will not arm and train those who wish to do harm to my fellow patriots." "We are in battle, patriots, for our homeland, our security and our way of life," he added. In response, the Council on American-Islamic Relations (CAIR) called on the U.S. Department of Justice to investigate possible federal civil rights violations in regards to Hallinan's store. CAIR said that systematically banning Muslims from such businesses is a violation of federal laws prohibiting racial and religious discrimination in public accommodations. "These bigoted declarations are no different than 'whites only' signs posted in businesses during a period of our nation's history that we had hoped was over," said CAIR National Communications Director Ibrahim Hooper. "The Department of Justice must investigate these hate-filled and un-American business practices to determine whether federal civil rights laws are being violated."